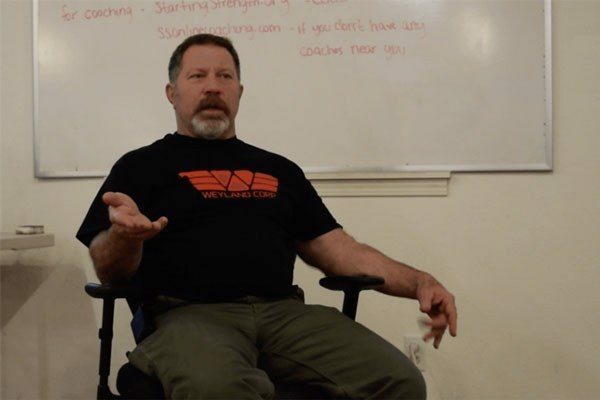 As I read about my fellow lifters’ experiences on the Starting Strength forum I encounter a common theme with the active duty military folks: lifting weights isn’t entirely compatible with military culture and combat-related fitness. 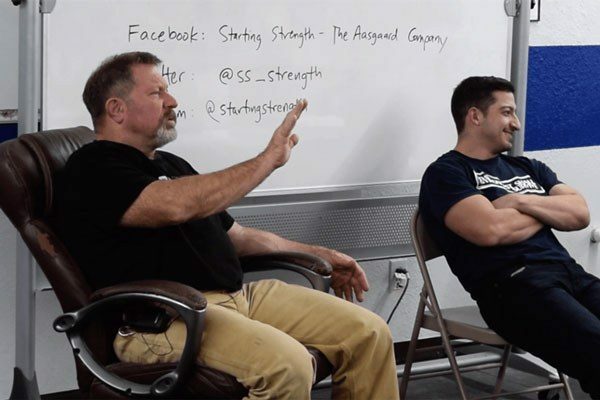 I feel compelled to share my thoughts on why Starting Strength is exactly what we need. In my last two years serving as an instructor at the United States Military Academy in the Department of Physical Education I have had time to reflect on my military service. Reminiscing on my service as a troop commander during Operation Iraqi Freedom and the years of training leading up to that time I know I owed my Troops more. One area in which I could have done better was the physical preparedness of my Soldiers. 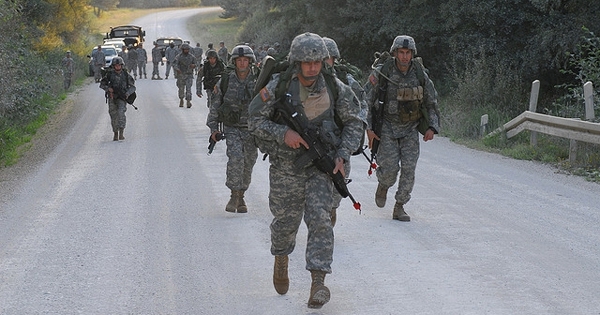 The US Army has a strong focus on low-intensity cardio-respiratory and muscular fitness. Since I understand that there are many fitness buzzwords out there, allow me to define these two. In this context “intensity” refers to the relationship of work performed to the maximum capacity of that “system,” cardio-respiratory or muscular. In this context, low-intensity cardio-respiratory work capacity would be similar to the normal Army 4-mile unit run while high-intensity cardio would be more like a 40m prowler push; low-intensity muscular fitness would be like normal Army push ups while high-intensity muscular strength would be like a 1RM bench press. In order to prove that the US Army culture is low-intensity-focused one only need observe a week in the life of a Soldier from the hours of 0630 to 0730 all over the world. During this single daily hour of physical training most Soldiers are relegated to 3-5 mile runs and sit-up and push-up improvement programs. Semi-annually soldiers must pass the Army Physical Fitness Test (APFT) consisting of 2 minutes of pushups, 2 minutes of sit ups, followed by a 2-mile run on a flat road or track. Each soldier gets 10 minutes to rest between events but must complete the APFT in less than 1 hour. See Table 1 for passing and maximum performance standards by age and gender. The minimum standards are disappointing while the maximum standards are quite achievable. Physical training (PT) is usually given only minimal attention and is often the first victim of a busy training schedule. Creativity is the exception; resource limitations, lack of skilled personnel, and time constraints often dictate the activity conducted rather than specific combat-focused goals. Additionally, unit commanders are required to regularly brief their combat readiness, one measure of which is APFT performance. As a result, PT becomes APFT-centric and our soldiers rarely improve anything other than this low-intensity domain unless they are personally inclined to train in highintensity areas during their personal time. Most of the current Nintendo Generation is not so inclined. The fact of the matter is that the ever-increasing loads carried by soldiers and the occasionally frenetic pace of combat require high-intensity capacity. In an effort to protect soldiers our body armor is becoming larger and heavier, slowing us down and causing numerous shoulder and back injuries. Survivability comes at a cost – the extra weight slows us down so much that it prevents us from effectively pursuing the enemy. Most combat operations are not done at the limit of a soldier’s low-intensity capacity, because we don’t go out and do a 6-mile dismounted patrol as fast as we can, at least not intentionally. Rather, there are a lot of stationary guard duties, slow dismounted patrols in which we talk to the locals to gather information, and mounted patrols in which we sit in vehicles for extended periods. Every so often there is a brief period of furious activity as we make contact with the enemy, usually by IED or some type of automatic weapons fire. Combat is usually conducted at either the very low or very high ends of the spectrum. I strongly believe, through personal experience, that high-intensity training is the key to survivability and performance on the battle field. But if a Soldier buys in to the above – lifts heavy weights and eats to support that recovery – there is an additional hurdle: the Army “Tape Test.” The US Army uses height and weight to screen for obesity, similar to the body mass index or BMI assessment. At my considerable height of 5’4” I am only allowed to weigh up to 158 pounds, and yes, I get taped. Fortunately the only punishment for exceeding this 90s-small weight is a body fat analysis done by measuring the Soldier’s neck and abdominal circumference (and hips also in the case of women). These measurements, along with height, are used to approximate body composition. As long as body composition remains below the maximum body fat percentage (20% men and 30% women ages 17-20) then the Soldier is free to weigh in excess of the weight threshold. Too many Soldiers see the act of being taped as a personal failure and strive to avoid it. You would feel bad too if you were forced to stand in line with all the unit’s fat Soldiers and wait your turn to be measured in the privacy of your first sergeant’s office. In order to avoid such an embarrassing situation Soldiers are directed to do more “cardio” to get their weight down. As a result they remain weak. See for yourself in Table 2: are you Army fat? If you are, do you care? 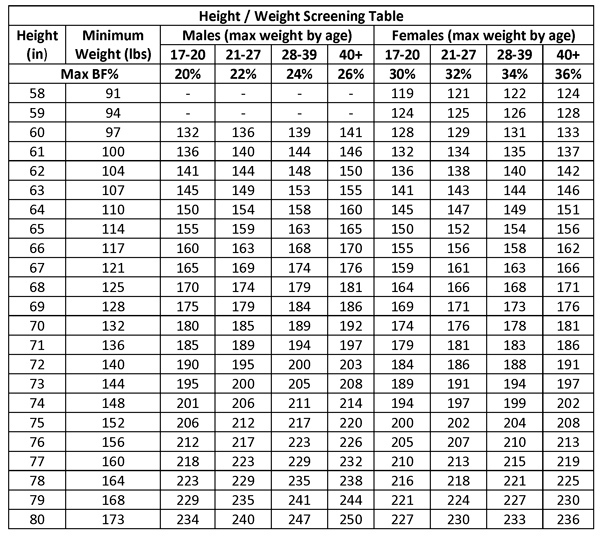 As a former combat commander I am more concerned with the second column in the table above, the minimum allowable weight, than I am with the maximum weight. Is a 111 pound soldier really an effective member of an infantry squad? Can that soldier carry the average soldier when wounded on the battlefield? If the maximum allowed weights are admittedly low in order to catch most of the fat Soldiers we should consider raising the minimum weights high enough to catch the weak Soldiers, but then that implies we’d know how to make them bigger and stronger once we’ve identified that they are weak. My strong-but-fat Soldiers were great contributors in combat, and often they were the best performers both mounted and dismounted. They were more durable and more versatile. Our problems were with the skinny-fats and the sparrows; they couldn’t keep up on dismounted patrols under load, couldn’t kick in a door, couldn’t evacuate anybody over 140 lbs, and couldn’t intimidate an insurgent. I do not dispute the need for a baseline of low-intensity fitness to conduct combat operations. Dismounted patrols in the streets of Baghdad and mountains of Afghanistan, lengthy guard shifts in which soldiers stand for hours in a minimum 60 pounds of gear (33 lbs medium-sized enhanced body armor with attachments, 7.5 lbs rifle with magazine, 7.5 lbs basic ammunition load, 4 lbs water minimum, 3 lbs helmet, 5 lbs boots and uniform, not to mention intra-squad radios and first aid equipment). Undoubtedly these operations require such low-intensity fitness. However, the overlooked quantity here is strength. Again, sixty pounds is the minimum load; this minimal load does not account for radio operators, machine guns, medical equipment, and breaching tools – equipment needed on every single mission. What then prepares a Soldier to carry loads in excess of 80 pounds? If low-intensity performance is relative to maximal capacity, doesn’t it stand to reason that sub-maximal efforts become easier as maximal performance increases? A soldier who can do 50 pushups with a 1RM bench press of 200 pounds will obviously be able to do more pushups with a 250 pound bench press. And by extension a soldier with a 500 pound deadlift will be able to stand on guard duty under body armor longer than a soldier with a 315 pound deadlift. Remember, PT is supposed to be focused on combat, not the APFT. If the APFT is essentially the only training we conduct out of combat gear, does it still retain any value for measuring the actual required physical abilities? In December 2009 I decided that I would take 4 months to train for powerlifting and compete on March 27th. During that time I did very little running, running only 7 times from November to April for a total of 23 miles, probably because of my latent Army guilt for not doing what I’m supposed to be doing. I lifted 3-4 times per week for about 90 minutes per session, increasing my back squat from 365 lbs to 515 lbs, deadlift from 405 lbs to 490 lbs, bench press from 250 lbs to 300 lbs, and increasing my bodyweight from 170 lbs to 185 lbs. March 29th began my training for the APFT 4 weeks later. My basic plan was to conduct one APFT diagnostic test weekly, 2 interval training sessions, 1 slow run of 3 miles, and 1-2 lifting days each week just to keep my sanity. Intervals were to consist of 400 meter intervals with a 1:2 work to rest ratio followed by Tabata push ups and sit ups. 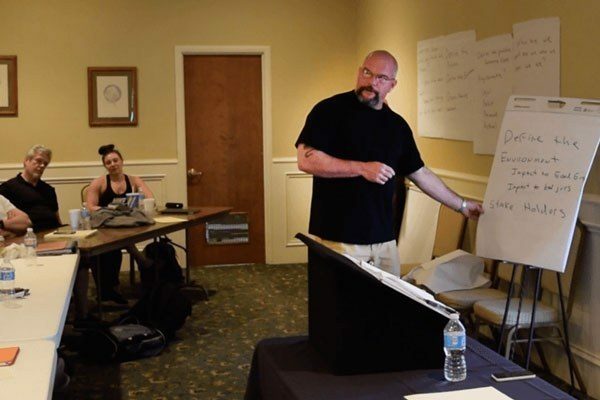 The APFT diagnostic test was performed on the official APFT course each week in order to familiarize myself with the course as much as possible. The distance run was done with a 20-lb weight vest on so that I could run with my much larger and stronger training partner, the very same partner that trained me through the powerlifting phase. The 400 meter intervals were programmed by using a formula from Army Field Manual 21-20: Physical Fitness Training. You obtain the working time of your 400 meter interval by dividing your goal 2-mile run (2MR) by 8 and then subtracting 5 seconds. Using this formula and a goal time of 13:00 my 400 meter time was 1:32. Then you determine your resting time between intervals by doubling your running time. During the course of our training we identified that we were running the 400s far too fast, often finishing faster than 1:20 and never exceeding 1:32. My concern was that I was training a motor pattern that my cardio-respiratory system could not sustain for more than 2 minutes. After 2 weeks we switched to 800 meter intervals using a similar formula, dividing our goal 2MR by 4 and subtracting 10 seconds giving us a goal of 3:05 per interval. Because this was a slightly slower pace than we had been running in our 400 meter intervals we gave ourselves relatively less recovery time, resting 5 minutes in between intervals. The 400-meter intervals were the key to getting us out of our comfort zone of the weight room and running again while allowing us to experience a degree of success and not beat us down mentally, while the 800-meter intervals were more effective in establishing a sustainable motor pattern. Key to this process was the weekly diagnostic APFT. Seeing our weekly progress gave us the confidence to stay the course with our plan and not revert to the 5-mile daily run mentality. Table 3 shows my improvement as measured by our weekly diagnostic APFT. Also important to my training plan was my transparency. I had spoken with my peers and students about my theory and training plan in the hopes of forcing myself to fully comply with the training program. I had no problem complying with my powerlifting training because that was fun for me, accomplishing PRs nearly daily was a blast. However I receive little joy from running. My transparency successfully ensured my compliance. The conditions on test day weren’t the worst possible but were far from ideal. The temperature was in the mid 50s but the wind was gale-like, 15-25 mph with 35 mph gusts. At the risk of quibbling, I’m confident that the wind cost me 30 seconds or more. I fell short of my APFT goals and was initially dissatisfied. But as I reported my scores on my APFT card I noticed that I had improved my run time in a horrible wind while weighing 10 pounds more. I am confident that without the wind it would have been my fastest 2MR time in more than 10 years. 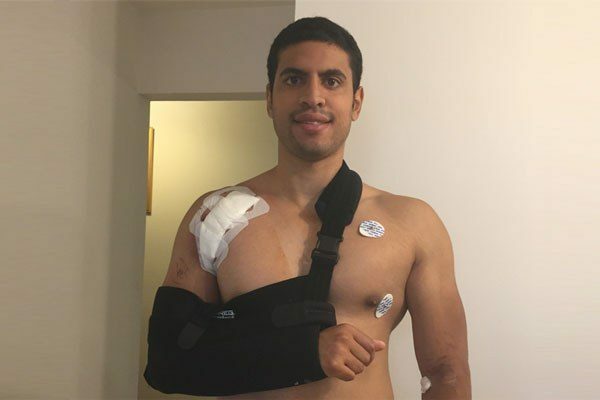 In 4 months I increased my strength tremendously and slightly improved my low-intensity performance on the APFT with a very short training cycle. And furthermore, I was much happier during my training plan, doing what I enjoyed most of the time and always attacking every training session with specific goals and the intensity that accompanies such focus. If I could achieve similar results with my own soldiers I would consider it a huge success and I would have a much more combat-ready unit. This is obviously not the only way to prepare for combat or the APFT, but it was my way and it worked. 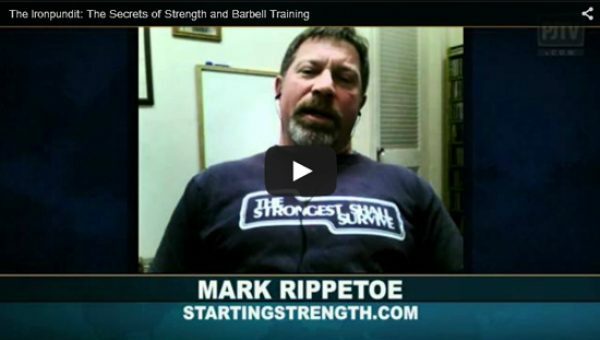 I provide this to the Starting Strength community because I believe it can work for you also. My point is this: do what you like to do, not what you think the military thinks you should be doing. Too many people partake in the self-flagellation of endurance workouts because of their need to comply with their own perception of the military’s cultural norms. These poor souls end up half-heartedly following vague workouts tailored towards low-intensity performance; they are often unhappy with their activity and performance, and only feel redemption when in pain. Worse yet, their focus on the low-intensity domain yields very little improvement in any area of fitness. Instead, do what you already know you should be doing and commit to it. If you like to run, go for it. If you like to lift, do that. If you’re stuck doing a dumb unit PT plan against your better judgment, my condolences. A big reason many of us don’t do the program is because of these other professional requirements, and in my opinion that isn’t a legitimate concern. Following the program doesn’t just make you stronger; it lays the base for success in both combat and for the APFT. 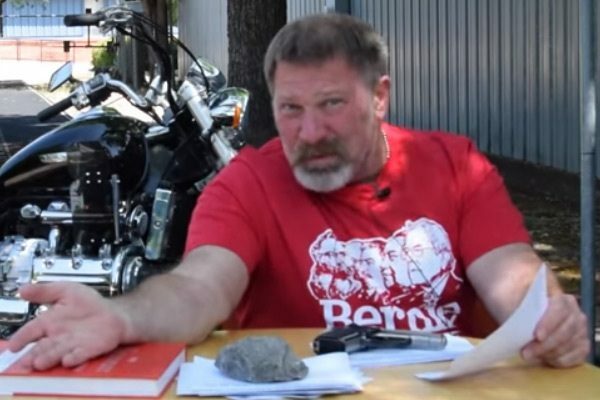 You can’t just lift weights and succeed on the APFT, but you sure as hell can lay down a rock-solid foundation that will make you strong as hell and allow you to succeed on the APFT with minimal training, and still be fully prepared for the actual demands of combat.